In 1984, Warner Brothers released a little movie called “Gremlins”. The premise was simple… a young man receives a mysterious adorable creature called a Mogwai as a pet. He is given three simple rules for taking care of it. It must not be exposed to water or sunlight, and it must not be fed after midnight. For the longest time, “Gremlins” and its sequel, “Gremlins 2: The New Batch”, were the only horror movies that I had ever seen. In fact, I don’t think I even saw Gremlins 2 until it came out on video; I read the paperback novelization in elementary school. I was startled to discover that they were generally considered horror-comedy or satire. As a child, the nuances of the Gremlins franchise were lost on me. 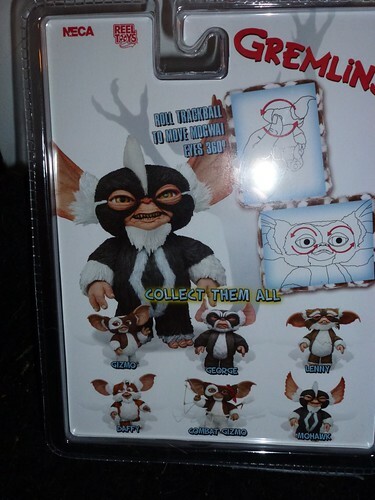 All I knew was that Gizmo the Mogwai was cute, the Gremlins were scary, and in the absence of actual Mogwai in real life, I desperately wanted a lunchbox with Gizmo on it. 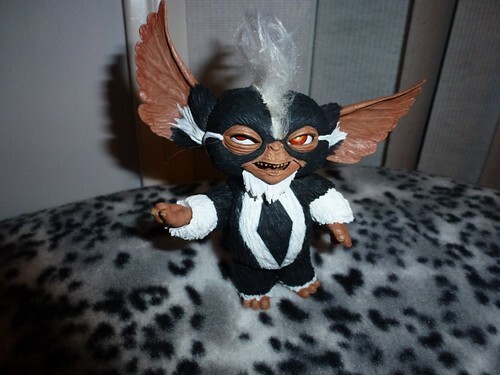 In 2011, NECA brought me a little closer to achieving my dream by releasing the San Diego Comic Con Exclusive Gizmo, which came with sunglasses, a tiny SDCC attendee badge, and a SDCC loot bag in which he could hide. 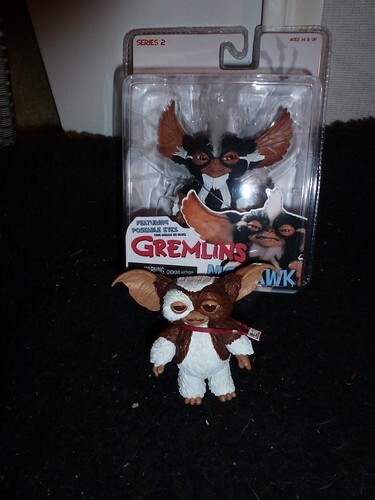 Since then, NECA has released two series each of Mogwai and Gremlins, with fairly impressive articulation and a neat little gimmick. 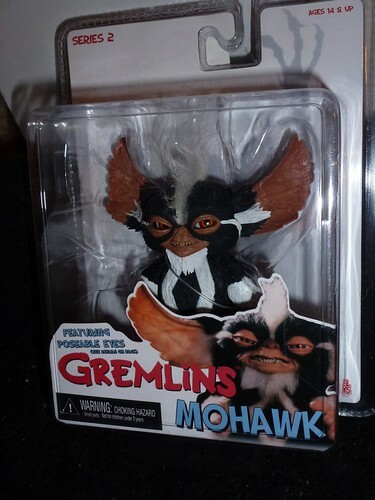 Today, I’m taking a look at Mohawk, from the second series of Mogwai. 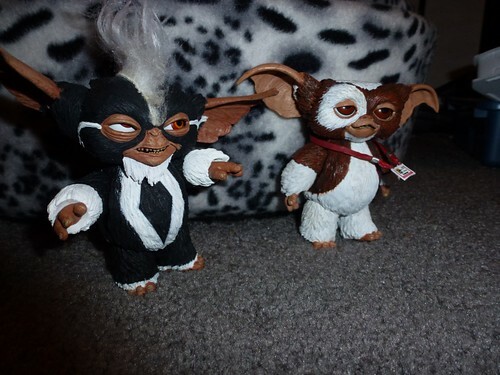 Series 1 of the Mogwai consisted of Classic Gizmo, George, and Lenny. I held out for Series 2, which includes Daffy, Combat Gizmo, and the villainous Mohawk. This was almost entirely because I felt that Mohawk’s fluffy little crest added extra value. NECA’s Mogwai action figures are as articulated as they can be while remaining screen-accurate… maybe even more articulated than necessary. I generally consider arm and hip and neck articulation to be the bare minimum, but the hip articulation doesn’t let them do much, given their chubby proportions. They can shift their leg positions, but they can’t sit down. Fortunately, the arm, elbow (?) and wrist articulation adds a lot of expressiveness to their posing, as do the ball-jointed neck and ears. The real highlights are their eyes, which are movable via a camouflaged rolling ball in the back of their head. The downside is that it can be difficult to get the eyes positioned just-so. I think Mohawk might have slightly better eyes than SDCC Gizmo, since my SDCC Gizmo is constantly rolling his eyes up into his skull… but it’s still a challenge to get both eyes looking in the same direction. I was a little disappointed by the texture and look of the mohawk. It appears to be a thin strip of long-pile fake fur glued on to his head, and some fraying woven backing is visible. I’m a little worried that the fake fur fibers could shed with little provocation. It still looks good from most angles, though, and I’m sure that this wouldn’t bother me if I didn’t dabble in teddy-bear making. On the other hand, look at the amazing detail involved in Mohawk’s tiny teeth! I was astounded to find that even his jaw is articulated. 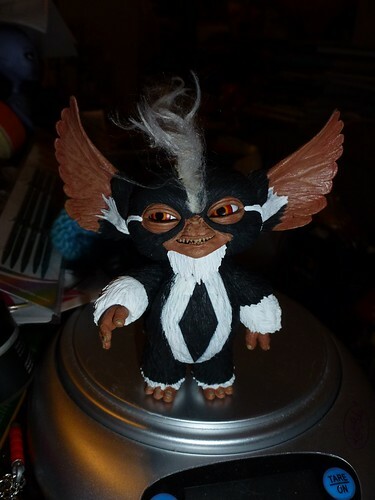 Because these Mogwai are a petite 4″ tall, you have to get down to their eye level for maximum effect. While I normally advocate the use of natural light for toy photography, I think the flash actually enhances their look, as it puts a little spark of life into their eyes. 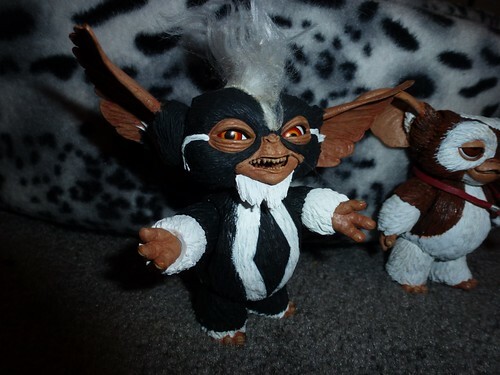 NECA recently confirmed that Series 3 of Mogwai would be coming out in January or February of 2013. I’m looking forward to seeing how Mohawk’s predecessor, Stripe, fares in terms of hair quality!